NATUAL HABITAT AND PREFERRED SITE: Citrus is tropical, can only be grown in the Rio Grande Valley in the southern tip of Texas and prefers deep sandy loam soil. Citrus grows best in a well-drained slightly acidic sandy loam soil. It can tolerate sand or clay soils if the drainage is good. Other than the southern tip of Texas citrus needs to be grown in containers or very carefully protected from winter freezes. Citrus trees will produce 4 or 5 blushes of new growth a season but in Texas they will only flower and bear fruit on the spring bloom. IDENTIFICATION INFORMATION: Small evergreen trees with glossy foliage, fragrant flowers and colorful summer fruit. FLOWERS AND FRUIT: Small fragrant white flowers in the spring followed by decorative and delicious fruit. Flowers are edible and can be used in herb teas. BARK: Gray to brown and relatively smooth. FOLIAGE: Evergreen and glossy, can be used in herb teas. CULTURE: Except in the southern tip of the state citrus needs to be grown in containers. Plant all citrus high in the soil with the graft union above the soil line. Citrus needs very little to no pruning. Citrus matures in 4 to 5 years. It is tropical. PROBLEMS: Freeze damage in all but the southern tip of the state. Root knot nematodes can be easily controlled with orange rinds ground into a pulp and worked into the soil. 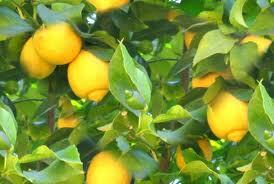 PROPAGATION: Citrus can be grown easily from seed but the fruit will not necessarily come true. The best time for stem cuttings to be made is at the end of the winter just before the emergence of new leaves. Seed or stem cuttings can be planted anytime as long as they are protected from freezing weather. Best results come from planting in warm soil and warm weather in the spring. INSIGHT: All of the citrus species can be grown in the Rio Grande Valley and the most southern part of the state but some winters there can even be damaging. Satsuma orange is the most commonly recommended and supposedly the most cold tolerant of all the citrus but even it still needs winter protection in most of the state. Trifoliate or hardy orange (Poncirus trifoliata) is a deciduous tree that will grow all over the state in full sun to a height of 15 feet. It has fragrant spring flowers and a hard, bitter, inedible yellow orange fruit. It can be propagated easily from cuttings or seed and it is easy to grow to form an impenetrable hedge. It is often used as the root stock for citrus trees. Considered ugly, I think it is an interesting plant with a very good use for property lines making a great barrier plant. Citrus hystrix, commonly called kaffir lime or lime leaf, has very interesting double leaves and a lemony taste. It makes an excellent ingredient for cooking and herb teas. Orange is Citrus sinensis, tangerine or mandarin is C. reticulata, grapefruit is C. paradisi, lemon is C. limon, lime is C. aurantifolia, tangelo is C. reticulata x C. paradisi, clementines are mutations, and kumquats are a completely different genus – Fortunella spp.